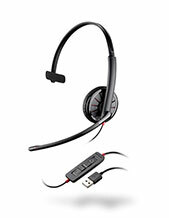 Plantronics Blackwire C3225 Stereo 3.5 mm/USB Headset is an innovative corded device that supports Unified Communications platforms. It is the perfect device for users who want a headset that is easy to connect to several devices and easy to deploy. More than just its connectivity, it also provides top-notch audio quality with Hi-Fi stereo sound, noise-cancelling microphone, and PC wideband. These technologies and systems help in ensuring that users get to benefit from crystal clear conversations, which can later help them in improving their productivity at work. 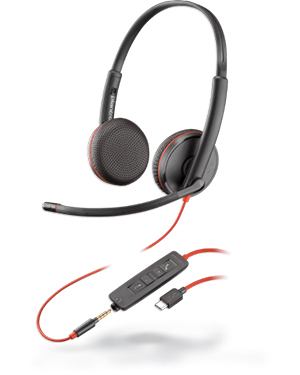 Plantronics Blackwire C3225 Stereo 3.5 mm/USB Headset is perfect for workers like call centre agents, secretaries and executive assistants, and receptionists. This device can be connected to PCs and mobile devices like tablets and smartphones. And more than this, it also boasts incredible comfort and top-notch portability. The comfort it provides help in users to easily make use of it for the entire day at work. Get to know this incredible offer better by calling our Headsetsonline hotline: Australia wide 1300 131 133! Headquartered in Santa Cruz, California, Plantronics is a top-notch company that delivers products and solutions in the global market, with its production and manufacturing floors located in China and Mexico. It provides its products and services effectively to customers all over the world with the help of many distributors, service providers, and retailers in 80 countries in Asia Pacific Region, Europe, and North America. 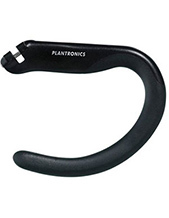 Plantronics was founded in the year 1961 and currently operates under the leadership of CEO and President Joe Burton. Incorporated in in the year 1988, it has even improved their operations and product portfolio since then. This is how the company is able to cater to contact centres and offices of all types worldwide. In fact, it already has the assistance of approximately 5,000 employed experts all over the world. It takes pride in being one of the best business and consumer audio communications equipment developer and manufacturer. Australia’s biggest online store currently operating excellently, Headsetsonline Pty Ltd is one of the companies in the country that offers not only high quality but also wide variety of products and solutions that can cater to the needs of all types of customers. Its extensive product portfolio includes brand new, pre-owned, refurbished, and second-hand items that can benefit all customers. Headsetsonline is also popular for its high quality services, which have all been polished from its years of experience as a division under a well-known enterprise. In addition to these services, the products offered by the company are ensured to be are Australian standards certified with the company deciding on going with Australian distributors over grey imports. And the bonus with this choice comes in the form of warranties that cover Australia-wide application for customers all over the country. 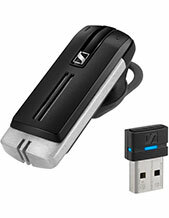 Headsetsonline offers all of its products and services through an enterprise-encrypted and secured site, Headsetsonline.com.au, which is why customers are guaranteed to be protected while doing their online shopping.